Loquacious—as are all good barbers—Gilberto Valladares, aka Papito, speaks at the same speed and enthusiasm as his hands handle the scissors. However, his conversation doesn’t involve homeruns made by his favorite baseball team or inappropriate comments about the beautiful woman who lives just across the street. Neither does he attempt to captivate his clientele by talking of the merits of a new hair dye that will soon hit the market or how many liters of silicone a certain movie star has in her body. Instead, Papito talks of his projects, his most recent find in the shape of a rare or valuable piece for a future hairdressing museum, or a new addition to his art collection, To the Last Hair. It’s therefore hardly surprising to find seated in Papito’s salon a popular TV announcer determined to change her look or a renowned Cuban art curator waiting for a traditional and sober haircut. Born in Havana in 1969, Gilberto Valladares confesses that he was a restless child, easily distracted in the classroom and not given to school work. His parents soon urged him to learn a trade, and so he chose—not with much enthusiasm at first—to become a barber. Having completed a training course, he took his first job as a barber in the working-class Havana neighborhood of Jesús María. Discovering that he had a real flair for the trade, he moved on to the more sophisticated salons of the capital, but becoming a top barber was not enough for the inquisitive and restless young man: he developed a passion for the history and traditions of hairdressing, which in Cuba dates back to 1552 when the Spaniard Juan Gómez, deft at trimming hair, beards and moustaches, extracting teeth, treating wounds and giving bleedings, received his barber’s license. 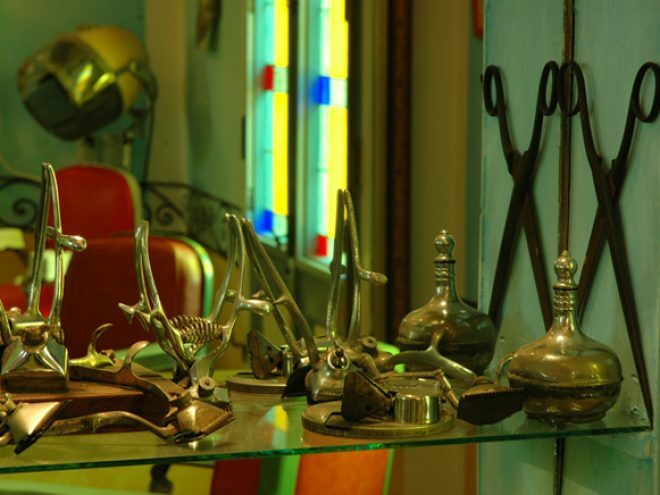 This interest in his trade led Papito to start his unusual collection of hairdressing artefacts which are exhibited at his private salon, a sort of “interactive museum” where the customer, while comfortably seated in a hundred-year-old chair awaiting his turn, may view antique scissors, razors, mirrors, vials, shaving brushes, combs, brushes and ads, along with original paintings and drawings by Cuban artists, all focusing on the topic of hairdressing. Papito proudly displays these paintings on the walls of his salon, Artecorte (Cutting Art), convinced that these pieces constitute the beginnings of what one day will become the first Hairdressing Museum in Cuba. But Artecorte is much more than this. Since 2002, Papito’s cultural project, which has gained the support of the City Historian’s Office headed by Eusebio Leal, has brought together barbers, hairdressers, models, artists and historians who seek to preserve and disseminate the history of hairdressing in Cuba. To this end they organize exhibitions, shows and art festivals. Artecorte also presents the Juan Gómez Award to the most experienced and successful hair stylists, and celebrates a number of events, including Barber’s and Hairdresser’s Day, first begun in 1946 in honour of Cuban barber, poet, journalist and patriot, Juan Evangelista Valdés Veitía (1836-1918). To celebrate this day, on December 27, 2006, a simultaneous haircutting event gathered 193 barbers and hairdressers who turned Old Havana’s Plaza Vieja into a huge outdoor salon, and also served as the perfect setting for “Habáname” (Havana-me), a hairstyle show that exhibited creative and fantasy coiffures inspired by emblematic sites and monuments of the city, such as the Morro Castle or the mythical city symbol, the Giraldilla.